Sumabe® Vitamin D3 25,000 IU can assist in building and maintaining healthy bones. Vitamin D3 promotes the absorption of calcium and can help to support healthy muscles. 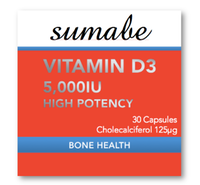 Sumabe® Vitamin D3 helps to maintain healthy bone density by providing minerals to the skeleton as well as improving absorption of calcium and phosphate which are essential for healthy bones. Sumabe® Vitamin D3 helps to build and maintain muscle strength in older people, which may reduce risk of falls.